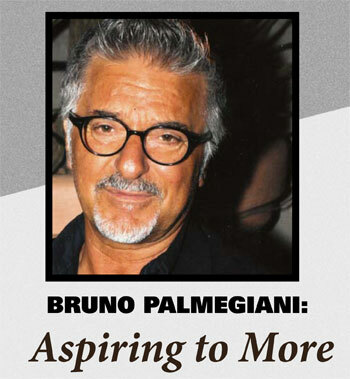 Even as a teenager, Bruno Palmegiani sensed what a pair of glasses could do for a person’s image. As an aspiring rock musician, he always wore sunglasses while playing the guitar to help project the persona of a cool, hip rock star. Today, as the designer behind the Ermenegildo Zegna eyewear collection, Palmegiani creates the glasses and sunwear for the luxury brand, worn by such style icons as George Clooney, Denzel Washington and Laurence Fishburne. Like many young men, Palmegiani’s passion for rock and roll eventually burned out. By then he was an 18-year-old student in Turin. Fascinated by fashion and creativity and needing money to pay for his studies, he began working with his uncle, a designer of men’s made-to-measure clothing. While Palmegiani’s sense of style evolved through his experiences in music and the fashion business, he learned about eyewear by studying to be an optometrist. After graduation he owned and operated an optical store in his native Rome for seven years. That aspiration led him to De Rigo Vision in 1980. It was a crucial time in the evolution of sunglasses, which were morphing from simple eye protection to fashion accessories, and Palmegiani was looking for a company on the cusp of that change. He joined De Rigo as a sales rep but his big break came when the company’s sunglass designer unexpectedly left the company. Since then, Palmegiani has worked for the Vuitton group, designing eyewear collections for Givenchy, Celine and Loewe. And since 2005, he has designed the Ermenegildo Zegna eyewear collections, interpreting the core values of the Italian design heritage – craftsmanship, style and quality – and transferring them to eyewear. Zegna was created to produce the world’s best fabrics and is best known for its men’s clothing line. Their tailored suits focus on creating a perfect fit and the same high standards are applied to every eyeglass frame. Ronor Occhialli recently obtained the Canadian distribution rights from De Rigo Vision for the collections and Ontario Sales Manager Pat Salamat says the response has been outstanding. The brand is uniquely positioned as male luxury, classical, stylish, and elegant. It’s classic style sits ideally between the designer and bridge segments.